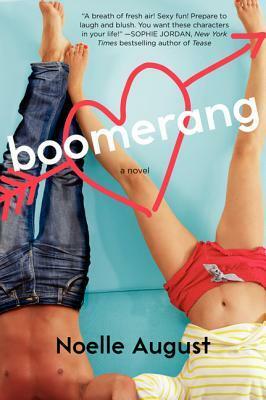 Jaime had the chance to talk with Noelle August, the penname for writer duo Veronica Rossi and Lorin Oberweger, the masterminds behind Boomerang, a new adult novel out now. Keep reading for the interview, and then go check out the book for yourself! 1- Why do you choose to use a dating site as the "meeting place" of Ethan and Mia? Any personal experience? Lorin: I’m pretty much a serial monogamist and not even sure I’ve ever been on a real “date.” At least not the “awkward-getting-to-know-you” variety. So, I’m sure some of it was a desire to experience the highs and lows on a vicarious basis! More than that, I loved the idea of two people vying for a job at a place that would also allow them to consider and comment on the state of modern romance/relationships, so a dating website seemed pretty tailor-made. I also loved the irony of the company’s absolute “no dating” policy, coupled with their need to embark on “research dates.” So much delicious material to mine! Veronica: Like Lorin, I loved the idea of the "research dates." We knew we could have a ton of fun with those, and we did! And no personal experience, although I bet working for an online dating servince would've been a fun job! 2- Why do you think dating sites have become so popular these days, and do you think they are a good way to meet people? Lorin: I think they’re popular because it’s tough to actually meet people these days! Our communities are a little more diffuse, and we spend more time at our jobs and online. So, what could be better than perusing dozens and dozens of profiles from the comfort of our own homes, sending out a safe little “hello” and letting things develop from there? I think it’s great to meet people online because you can connect with someone’s mind and heart first, but it’s hard to TRULY determine if the magic is there until you’re face-to-face. Still, I’ve heard of an awful lot of online dating success stories, so it must work for some folks! Veronica: Everything Lorin said! I have lots of friends who have met their Significant Others online. It's a great option for lots of people. 3- How did you choose the careers of our two characters? A filmmaker and a soccer star? Is there a specific reason, or just because film-making and soccer are awesome? Lorin: I just absolutely love everything to do with filmmaking. Next to writing, it’s the career that fascinates me most. So, once again, vicarious thrill, I guess! Veronica: Yes! Soccer is awesome! It's a sport I know pretty well and enjoy; I didn't think too far beyond that. BOOMERANG coincidentally released right around the World Cup, which was fun! 4-Ever had a "Forbidden love", or should I say "lover"? Would you try to resist a guy, if you were in the same situation as Mia and Ethan? Lorin: Sadly, I’ve never had a “forbidden love,” though I’ve had some relationships I kept pretty private for various reasons (nothing too illicit!). I’m kind of a “want it all” gal, so I don’t know that I’d be able to deny myself someone I felt as powerfully drawn to as Mia is to Ethan! Luckily, my own boss—me—doesn’t place any limitations on my love life! Veronica: Never had a forbidden love or lover, unless we're talking about the fictional kind. I do have a few book boyfriends. And it would be tough to resist Ethan, I must say. Not sure I could do it! 5-Why "Boomerang"? Is there some significance, or just that it is a pretty awesome name and definitely an awesome thing to play with?! Lorin: The name just popped up during brainstorming. We thought it was an awesome name for a dating site for people on the rebound, and, as always happens, the term took on all kinds of additional meaning as we wrote. By the way, Veronica bought me an awesome boomerang in celebration of our book sale, but I’m terrified of trying it in my urban neighborhood and winging passing dogs and people. Need to bring it somewhere roomy! Veronica: Hah! Lorin, we'll have to give that thing a whirl next time I'm out your way! 6-The cover is incredibly cute! One of my recent favorite contemporary covers! Did you get to get your hands dirty, or offer any input into the cover design? Lorin: Actually, yes! When we were working on the book proposal, we both picked images to use as inspiration, pictures that captured something of the sensibility of the project we had in mind. When our editor asked us for cover input, we sent some of those pictures over—the cover image included—and they picked it and, with some modifications, ran with it! I’ve loved it from day one, so I’m glad you do too! Veronica: It's so eye-catching and cheery. We've had some great feedback on it. Very glad you like it, too! Thanks so much for having us, Jaime!